Since the election, and the proposed deal to shore up the Conservative Government, there has been a barrage of criticism levelled at the DUP, some fair enough, some inaccurate and over the top. Think of Mac’s cartoon in the Daily Mail, showing caricatures of Irish people all drunk on the floor – wrong on so many levels. Some of this is because of the shock of the majority of British people seeing a small provincial party with deeply conservative social views out in the open – and in a position of power too – for the first time. Some comes from NI people opposed to the DUP who understandably want to warn the rest of the country about their ‘dinosaur’ tendencies. But there has perhaps been a second shock: it turns out these dinosaurs are actually quite tough, well-prepared, clever negotiators. And they’ve brought home the bacon, in the form of £1bn of extra public funding. From a UK wide perspective, it isn’t the dinosaur dimension that is most striking here – the UK Government is not going to rush out and reverse position on equal marriage, for instance. It is rather the contradictory nature of the package the Conservatives have given them. The DUP asked for a low-tax, high public spending package. And the Tories, whose virtual trade mark since 2010 has been low tax, low spending, live-within-your-means austerity, have given it to them. The Conservatives, whose leader told a nurse live on TV she couldn’t have a pay rise because ‘there is no magic money tree’ have given that tree a shake, and produced a plum for their NI partners. The rest of the UK is going to want to know where they have been hiding this tree for all this time. Answer: the Cayman Islands, as Artist Taxi Driver has pointed out (in, be warned, the earthiest possible language). To make matters worse, the DUP, having pocketed the money, went on to back the Tories in ensuring nurses and fire officers – remember those heroes of Manchester, London Bridge, Grenfell? – won’t get a decent pay rise, not on their watch. Back in Northern Ireland, the rest of us now have to deal with a DUP whose sense of self-importance was already, shall we say, robust, fresh from the doorway of Number Ten. The extra funding, to be sure, is welcome, and much needed. But perhaps DUP celebrations should be tempered by the damage that they have done to their own and Northern Ireland’s reputation with others across the UK. The Scots, Welsh and English regions will be furious. Even the Scots Tories must be looking at this deal with distaste. And it’s unlikely that the deal will have done anything to endear the DUP to the English Tory Government they’ve struck it with. The DUP’s obvious delight at scoring all this money is typical of a party that can’t tell the difference between the weather and the climate. They return to Northern Ireland claiming to have brought the sunshine; but at what cost to the general political climate? Are we entering a period of the deeper entrenchment of traditional divisions, and a contradictory fiscal position that cannot be sustained? What are the implications for the constitutional question in Northern Ireland, and for the Institutions set up in the wake of the Good Friday Agreement? Jenny Muir will address those and related issues in the next post! When we organised our Election Breakdown event for tomorrow night we had no way of knowing that the issues we intended to discuss – the change in public mood shown by the swing away from the Conservatives in the election – would be infinitely sharpened by the catastrophic fire at Grenfell Tower (and perhaps also by the attack on Finsbury Park Mosque, news of which is just breaking). Shock at the fire has been turning to anger, as details emerge of repeated warnings issued by residents groups fire specialists, and the housing trade journal Inside Housing. It appears that these concerns were repeatedly fobbed off: both in the specific case, by Grenfell Tower’s Tenant Management Organisation, and at a higher level, following an inquiry after a smaller but still fatal fire in 2009, by the Government who have not delivered promised changes to fire regulations. One Grenfell Tower resident is quoted as saying: “They don’t think this community is valuable, so they aren’t doing anything.” Whether this is the case or not, it is a telling comment, and all too many of the residents are expressing similar views. It is looking very likely that the promised inquiry will show people died due to poor governance, cost-cutting in the improvement works and lack of meaningful regulation – in one of the wealthiest regions in the country. There could be no starker illustration of the effects of a political economy designed to crank power and wealth to a tiny sliver at the top of society while forcing cuts on those at the base of the socio-economic pyramid. But the national mood has changed. We saw it at the election; but the fire has left an acrid smell hanging over not just Kensington, but the whole country. The tragedy is becoming symbolic of a wider anger amongst those who feel they are not listened to or treated with respect by a state that does not act in their interests. There is no doubt that these matters will come up in our discussion tomorrow. For those of us at the Combination, our thoughts are with the victims and their loved ones. Yet as The Combination’s Tanya Jones says elsewhere, real support “requires real solidarity and real change“. If there is anything at all positive in this situation, it is that no one can any longer be unaware of what is at stake in our collective debate. Let us strive, then, to ensure that this disaster comes as a catastrophe in the ancient Greek sense – a turning point. Polly Toynbee describes Grenfell Tower as ‘austerity in ruins’. It is too soon to tell, but it may just be the moment at which the dominant politico-economic paradigm of our time lost its hegemony. Join us tomorrow to discuss these and related matters. Election breakdown – where now for progressive politics? It can be argued that last week’s General Election marks a turning point: a shift away from neoliberalism and towards – or rather back to – social democracy. There is talk that the age of austerity is over. The initial focus on Brexit was replaced by a genuine policy debate, based around the Labour and Conservative manifestos and revealing voters’ anxieties about the state of public services. Young people were energised into voting in greater numbers, which could lead to changing political priorities as parties take them more seriously in future. The power of the mainstream media has been dented, as the public took little notice of their sneers and voted Labour anyway. The scale of Labour gains prompted discussion about the mechanics of campaigning, including the use of social media, the impact of positive messages versus smearing your opponents, and the importance of the ‘ground campaign’ through canvassing and rallies. On the other hand let’s not lose the run of ourselves. Despite unexpected Labour gains, the Conservatives are still likely to be in government, kept in power by the DUP: arguably a regressive partnership, rather than the progressive alliance we at The Combination had hoped for. And a partnership that regards the Good Friday Agreement as collateral damage. So are we in for more austerity, or will there be a sudden interest in putting extra funds into Northern Ireland? Are we to be faced with reinvigorated opposition to progress on women’s rights and LGBTQ equality, or will the additional scrutiny on the DUP’s positions force them to soften their stance? What are the implications for issues such as climate change and the transition to a low carbon economy? 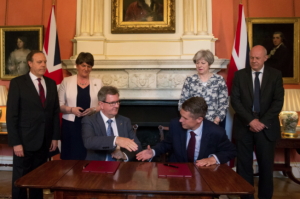 Can the UK Government continue as an ‘honest broker’ in Stormont talks when that Government depends on the confidence and supply of one of the parties to the talks? For the same reason, should the talks fail, how can direct rule from London be perceived as impartial? How are voters in the border counties to be represented when they have no active representatives above local Council level? Well, the Combination has organised a public meeting to address these and related issues, and to consider the implications of the General Election for progressive politics in Northern Ireland and farther afield. 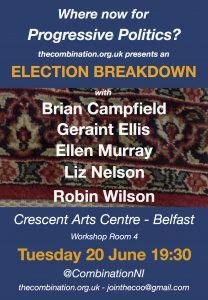 We’ve invited five speakers from a range of perspectives: Brian Campfield (NIPSA), Geraint Ellis (QUB), Ellen Murray (GenderJam NI and Green Party NI), Liz Nelson (Belfast Feminist Network and Belfast Trades Council) and Robin Wilson (independent researcher and journalist). 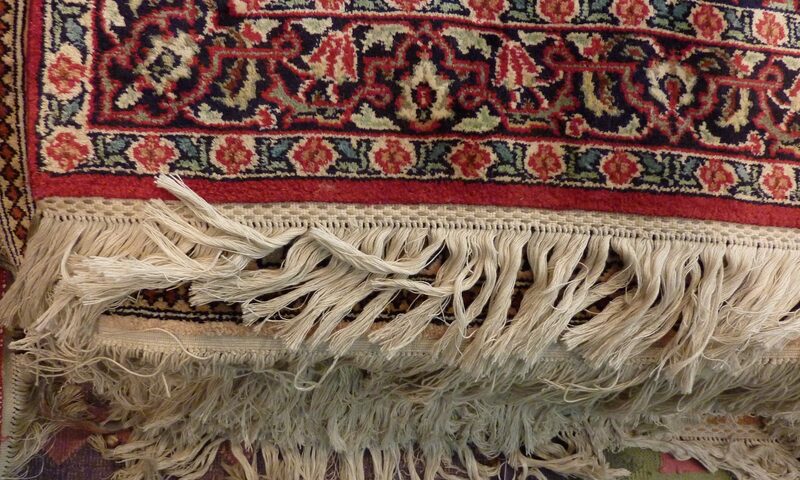 Join us on Tuesday 20 June, 7.30pm at the Crescent Arts Centre, Workshop Room 4. Is a progressive alliance a possibility? As the polls narrow, Jenny Muir looks at the possibility of a de facto, case by case, progressive alliance emerging from next week’s election. It is no surprise that the dominant General Election battles have been between the Conservatives and Labour in England and Wales; and between the SNP and the Tories in Scotland. The smaller parties have pretty much vanished from serious consideration, due to our perverse electoral system for Parliamentary elections. Although the polls are all over the place, the general trend has been a Labour surge at the expense of all parties other than the Tories. But that surge doesn’t bring Labour close enough to win a majority. With a few days to go, there’s all to play for. The long campaign was initially dominated by attitudes towards Brexit, perhaps prompted by talk of the ultimately unfulfilled pacts and alliances amongst anti-Brexit parties as much as because it was Theresa May’s reason for calling the election. It’s not surprising that May is now trying to pull the debate back to Brexit and by implication away from discussion about public services, where she was losing big time. Not only that: they are backing off from the strong and stable leadership message, which backfired as much for its lack of subtlety as its inaccuracy, when the leader crumbled under pressure and was too arrogant to take part in the traditional BBC TV debate. Jeremy Corbyn is having a good election, although I still doubt whether good enough to win. Manifesto commitments to improve spending on key services sound increasingly credible as he can (usually) answer the question ‘how are you going to pay for it’? It’s disappointing that Labour plans to keep Trident and nuclear power, increase airport capacity and won’t back a second Brexit referendum. But there’s much to welcome and people’s experiences of being let down by health, education, transport, housing or welfare benefits systems mean they are open to change. And yet… the question of his leadership ability hasn’t gone away just because Theresa May has been discredited in this area. If he can’t lead his party effectively then how can he form a Cabinet capable of delivering the manifesto? However, Labour has some very strong candidates – not all of whom support Corbyn, of course – and an unexpected endorsement from The Guardian. The current situation is that both Labour and Conservative are trying not to talk about leadership. If Labour can keep the focus on policy over the next few days then they will do better. If the agenda shifts back to the Brexit negotiations then the Tories will make bigger gains. Both Labour and the SNP have ruled out a formal coalition in the event of a hung Parliament, however in this situation a minority Labour government would be part of a de facto progressive alliance, able to implement its policies only on a case by case basis. This would allow meaningful participation from parties across the UK in delivering and improving upon a Labour programme, including some parties from Northern Ireland. There would still be disagreements: for example Labour and the Tories may well align against others to keep Trident and to resist further electoral reform. The West Lothian question would gain more salience and, paradoxically, it would be in Labour’s interest to obstruct moves towards Scottish independence. What would happen with Brexit is anyone’s guess. But much could be achieved, and in particular the task of reconstructing the public sector could begin.